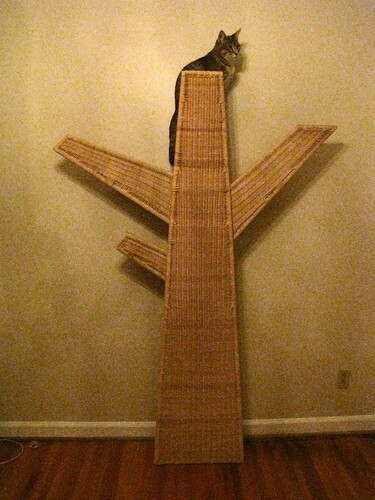 Yesterday at Ikea, along with a table, we purchased a wicker cat tree in the hopes of keeping the cats from further destroying the few nice pieces of furniture we do have. So far Abby, the kitten, has spent the most time exploring the wicker tower. I love Ikea. I have hopes for the wicker tower because when I opened the box to start the assembly both cats came over started clawing at it. As soon as they saw what I had they were both like, "Oh! Wicker!" and then went all scratchy scratchy on it. That has got to be the most tasteful cat tree I have ever seen. As much as I know my cat would enjoy it, I can't stand the thought of those tacky carpet-covered ones. I wish I lived closer to an Ikea. I'm actually thinking to buy this one as well, but have some concerns about the stability of that thing. My cats will not be too happy if that tree falls over along with them on it. You think it is stable enough? Did you fasten it somehow? I secured it to the wall with three screws. That thing is secure and stable. It ain't going nowhere. I should mention that it comes with a metal rod in the back that is designed to be secured to the wall with screws. Nicole, it's tastefulness is a big reason we got it. Those carpet covered ones are atrocious. All I need is a bare section of wall to attach it to. In our house of multiple book shelves they are hard to come by.